Video gaming is one of the most popular pastimes in the world, and Sony PlayStations are some of the most popular gaming systems used for hours of entertainment by video game lovers everywhere. 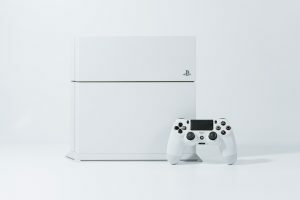 They provide superior graphics, and there are a great many video games made for PlayStation 4s, and since your PlayStation 3 video games are compatible with Version 4, all of your older games can still be played on the newer systems, which is a fact that extends the shelf life of your older games. If you should have a need to generate cash quickly and you have one of these high-quality PlayStation 4 gaming systems, you may want upon your PlayStation 4 in Mesa, Arizona at our pawn shop store, where you will get the absolute best payout for your valuable gaming system. If you’d rather not enter into an agreement which requires you to repay the money for your PlayStation 4, we can buy the system from you outright, and if you do intend to resume ownership of your game system as soon as possible, we can arrange for a 90-day pawn loan agreement with you. In a pawn loan agreement like this, you’d be responsible for paying a monthly installment payment, which is composed of an interest component and a principle component, and if at any time you are unable to pay that full amount, you would have the option of paying the interest only, to keep the loan agreement serviced. Any number of deferrals of the principle amount can be accommodated, although it would not be to your advantage to do this very often, since it will extend the life of your agreement with us each time you do so. If at all possible, it will be to your advantage to pay down on the principle amount as much as possible so that you can shorten the duration of the pawn loan agreement and again take ownership of your valuable Sony PlayStation 4 upon completion of the agreement. If you have a collection of video games t0 accompany your PlayStation 4, we can give you the best payouts on those as well, so that the amount we provide you with will be increased. When you do bring in your video games and your Sony PlayStation 4 gaming system, remember to also bring in all accessories which were originally packaged with the game system at the time of purchase, even including the bill of sale from the store where you bought the system, and the box it was packaged in. The reason for this is that a great deal more money can be put in your hands when you provide us with a complete system that includes everything, since that’s the kind of system which would have the most resale value, if we were obliged to sell the system to someone else eventually. If you have any other electronic devices around your household which you’d also like to convert into cash, please think of our pawn shop store in Mesa, Arizona before anyone else, because we aim to be your one-stop pawn shop store in the region. If you have other electronics you’d like to pawn, we accept everything of value. If you don’t have a PS4 to pawn, we also pawn Xbox One gaming consoles!